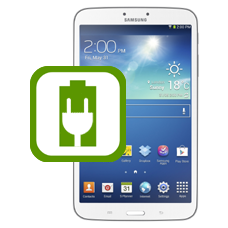 Does your Samsung Galaxy Tab 3 8.0 (SM-T310, SM-T311. SM-T315) no longer connect with your computer or is not charging when plugged in? Maybe you can see that the pins inside the Galaxy Tab 3 8.0 USB dock connector socket are broken. If any of the above symptoms are evident then you need a new micro USB dock connector / charging port socket. Our expert Samsung tablet technicians will replace the dock connector socket with a brand new genuine part. This is an in-house Samsung Galaxy Tab 3 8.0 charging port repair service, when ordering this dock connector repair service you are required to ship the tablet into our repair centre for works to be undertaken.